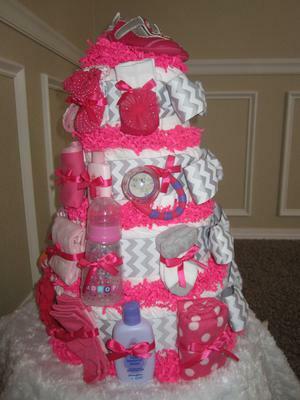 I decided to venture out and make my cousin a diaper cake to match her nursery, which is hot pink and gray chevron design. I got on YouTube and watched a demo on the fan method, I purchased Pampers swaddler diapers size 1 (they have the least amount of print on them). I purchased large and small ribbon, baby lotion, wash, powder, bibs, socks, shoes, bottle, bottle brush, rags, outfit, headband, clippers, receiving blankets and a few baby toys. I picked out round pans from my kitchen and figured out what sizes I would need. Once I started fanning the diapers out in the pan it went fairly quick. I put a rubber band on each tier before I tied a ribbon around them. I put a cardboard wrapping paper roll down the middle of each tier to hold the cake together. I tied a bow around each tier after I put the cake together (there is no glue needed). I purchased a bag of pink crinkle paper to put on top of each tier to look like frosting. This is going to be my cousin's baby gift at her shower so I purchased nice items to put on the diaper cake (some from her registry). 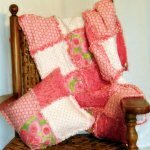 I think this is a great way to give a beautiful gift that can be used. I hot glued smaller ribbon onto the larger ribbon that is tied around the cake, so I could attach all of the baby items. I started with the smaller items on top and worked my way down. I am also in charge of games at the shower, so I am going to have all of the guests guess how many diapers I used in the diaper cake....should be fun! 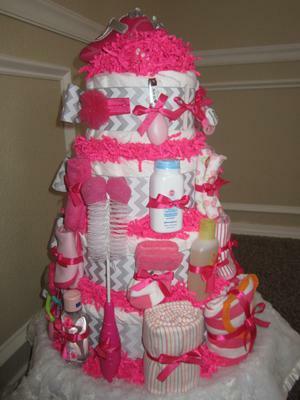 I ended up using over 100 diaper in the cake so it will be very useful for the mom to be when she is ready for size 1 diapers. 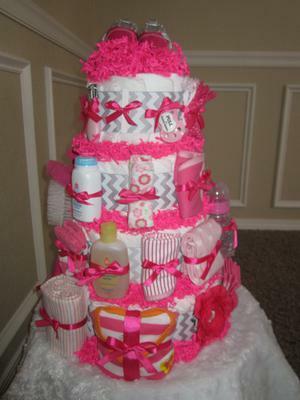 All of the diapers from the cake can be used so I would suggest buying good diapers so they will actually get used. This is a very time consuming project, but so worth it! It makes a beautiful shower decoration that can be used as a game and any mom would appreciate it! 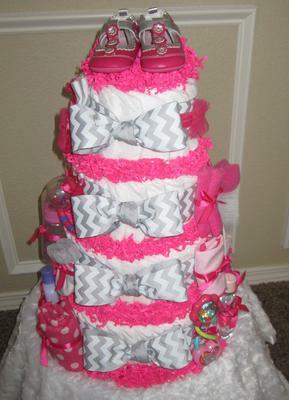 This beautiful diaper cake was made by my talented daughter. When she puts her mind to something, she does it and does it well.